Five Happy Yolks: 31 Days of Halloween Fun! As I said above, fall is my absolute favorite time of year and I have to say that Halloween runs a close second to being my favorite holiday! 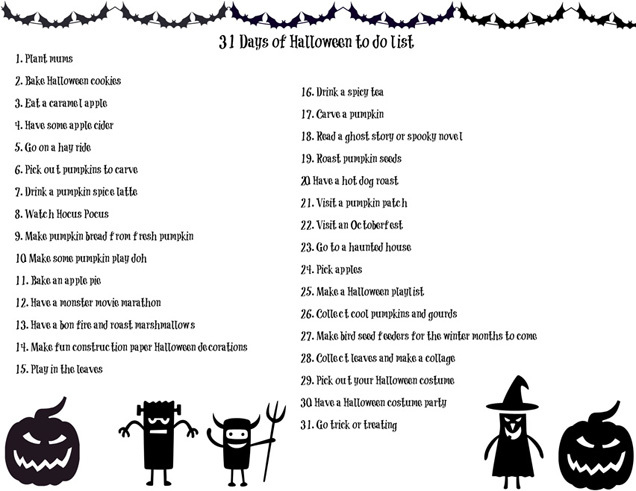 I created a bucket list of Halloween/fall fun. What are some of your favorite things to do in the fall? Our favorite is definitely the pumpkin patch and pumpkin carving! So much fun! We visited Rombach Farms last year and had SO much fun. I never miss a good pumpkin photo op! Drop me a comment and tell me what your favorite fall activity is!